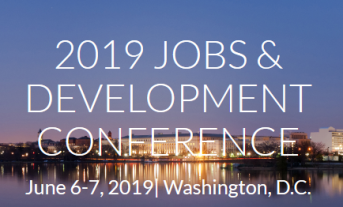 Following the success of the 2016 and 2018 Jobs and Development Conferences in Washington DC and Bogotá, the World Bank in collaboration with IZA (the Institute of Labor Economics) and the Network on Jobs and Development are organizing a follow up conference focused on “Improving Jobs Outcomes in Developing Countries.” The conference will take place on June 6th and 7th, 2019 in Washington DC. The two-day format will feature keynote speeches, a policy panel, and about 80 paper presentations in parallel sessions. The event will focus on policy-relevant research, applicable to identifying solutions to jobs challenges in low and middle income countries. Daron Acemoglu (MIT): "Productivity, Work and Wages: Lessons for Developed and Developing Economies"
Ricardo Hausmann (Harvard Kennedy School): "Growth Diagnostics and Jobs"
Theoretical models to understand the drivers of jobs outcomes in developing countries. The deadline for full papers or extended abstracts was January 15, 2019. Notifications on contributed papers will be sent by February 28, 2019. Any queries can be emailed to Dominik Spitza at spitza@iza.org. We strongly encourage submission of full papers. For extended abstracts, full paper submission is due April 1, 2019.